Few individuals have impacted a region as much as Michael Towbes has Santa Barbara County. A beloved businessman, philanthropist and community leader, Towbes embodied values that we hold dear: He believed in respect, equality, and working hard to help make his local community – and the world – a better place. Towbes passed away in April 2017 at the age of 87, and he is dearly missed by all who knew him, as well as by those who benefited from his extraordinary generosity. Fortunately, his legacy of giving lives on in programs that support the arts, promote sustainability, and help those in need. 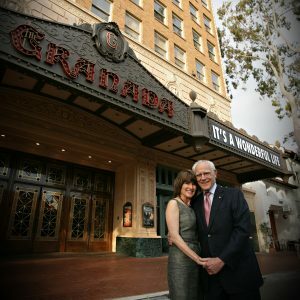 Michael Towbes and his wife, Ann, at the Granada Theatre in 2012. Towbes was a treasured member of our Santa Barbara Foundation family. He served as trustee and chairman of the board for the Foundation, and was named the 1994 Man of the Year. A major advocate for the arts, he set up the Towbes Fund for the Performing Arts (TFPA), a field of interest fund at the Santa Barbara Foundation. In 2018, the Foundation awarded $289,300 to 26 performing arts organizations through the TFPA. In addition to his volunteerism with the Santa Barbara Foundation, Towbes served on a myriad of local nonprofit boards. He spent 27 years on the board of Cottage Hospital, including five years as chair, and served as board president of Laguna Blanca School and Montecito Union School. He also served as a board member of the Scholarship Foundation of Santa Barbara, Santa Barbara Center for the Performing Arts, UCSB Economic Forecast Project, Housing Trust Fund of Santa Barbara, UCSB Foundation, Foundation for Santa Barbara City College, Lotusland, and the National Multiple Sclerosis Society (Southern California & Nevada Chapter), amongst others. Towbes’ devotion to serving California’s Central Coast went far beyond traditional philanthropy – his community-focused business endeavors played a significant role in shaping Santa Barbara County. He founded The Towbes Group, a large commercial and residential property management and development firm that emphasizes sustainability and philanthropy. Many of their residential properties are dedicated to affordable workforce housing and senior living facilities. The organization runs a “Give Where You Live” fundraising program, which combines public and private resources to create opportunities for local people struggling with poverty. Currently, the program benefits three local nonprofits: Future Leaders of America in Ventura, Guardian Scholars in Santa Barbara, and Community Action Commission in Santa Maria. Additionally, Towbes and his late wife, Gail, founded The Towbes Foundation in 1980. The Towbes Foundation awards grants triennially to organizations focused on education, social services, promotion and preservation of the free enterprise system, as well as visual arts/arts education. The Towbes Foundation’s impact is felt across our county, with grants offered to organizations large and small, ranging from the Cuyama Valley Family Resource Center to the United Way of Santa Barbara County. “The Towbes Foundation is a testament to Mike’s endless generosity and his devotion to the Santa Barbara community,” said Kristen Sullivan, Executive Director of the Towbes Foundation. In total, the Towbes Foundation donates more than $1 million a year to approximately 150 organizations. Towbes founded and served as Chairman of the Board of Montecito Bank & Trust, the Central Coast’s oldest and largest locally owned community bank. According to the Santa Barbara Independent, the bank invested heavily in the community under Towbes’ leadership, “giving more than $1.3 million annually to area nonprofits through the Community Dividends program, Anniversary Grants, and nonprofit sponsorships, focusing primarily on organizations whose missions support the arts, youth and education, social welfare and medical and health services sectors.” Today, Montecito Bank & Trust continues to support programs that benefit the community, including initiatives that address financial literacy, cyber security, and elder abuse. Michael Towbes’ legacy of giving lives on, both in spirit and in philanthropic resources. He has inspired generations of residents all along the Central Coast, from Ventura to Santa Maria and everywhere in between, to give back to their communities. Most importantly, Towbes’ commitment to helping those in need continues to build a more resilient, empathetic and inclusive Santa Barbara County.